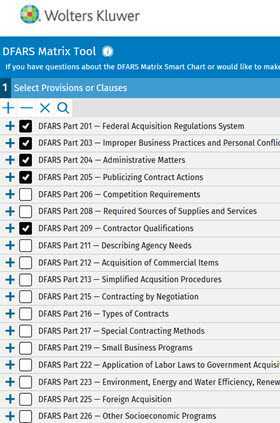 The DFARS Matrix Tool effectively consolidates your Defense contract clause and solicitation provision requirements in an easy-to-read chart format, seamlessly improving your compliance workflow. With full-text source information from the current CCH Department of Defense FAR Supplement, clear explanations from the experts at Wolters Kluwer, flexible online access from mobile devices, and the ability to save and export your data at will, the DFARS Matrix Tool provides the immediacy and expertise required to cover all your bases – and your bottom line. Proposal Adequacy Checklist for completion when submitting RFPs requiring certified cost or pricing data to the DOD under DFARS 252.215-7009.